Smok Mag Kit is the latest all-in-one setup from Smoktech and includes the Mag Box Mod and the latest TFV12 Prince Tank. This bundle features 225W of power, a trigger-like fire mechanism, a gun handle form factor, handgun magazine type battery loading, amazing ergonomics, low resistance capability, versatile temperature operation, an 8ml juice capacity, a top fill system and massive vapor output. With a trigger style fire button and ergonomic gun handle design, the appearance of the mod is very modern. The Mag Mod gets its name thanks to the way the dual 18650 batteries are accessed. This occurs via a side lock button that, when pressed, releases the entire battery bay in a similar way as you would release a handgun magazine. The device is also portable thanks to dimensions of just 65mm x 30mm x 92mm. You may purchase the mod in black/red, black/prism, gold/black, silver/black, purple/black, green/black, navy blue/black, red/black, pink/black. On the large side of the Smok Mag, you will find a full color HD OLED that can be set to six different color schemes including blue, purple, brown, red, silver and green. On the screen, there’s a menu that includes vape data such as wattage, temperature, battery bars, puff time, resistance, voltage, mode and more. Underneath, two adjustment buttons are shaped like parallelograms and have the same color scheme as the mod. And, a 510 connector at the top will allow for installations of any standard atomizer in the market place. Technically, the specifications are quite impressive, resulting in a versatile device. The maximum output is 225 watts or 9 volts, while the lowest resistance capability is 0.05ohm (temperature modes) or 0.10ohm (power mode). Although not listed, this unit is sure to be capable of temperature control with all heating elements including a TCR mode for entering custom coil specifications. For safety, the device is built with multiple protections and also features USB upgrades in case a new operating system is released. 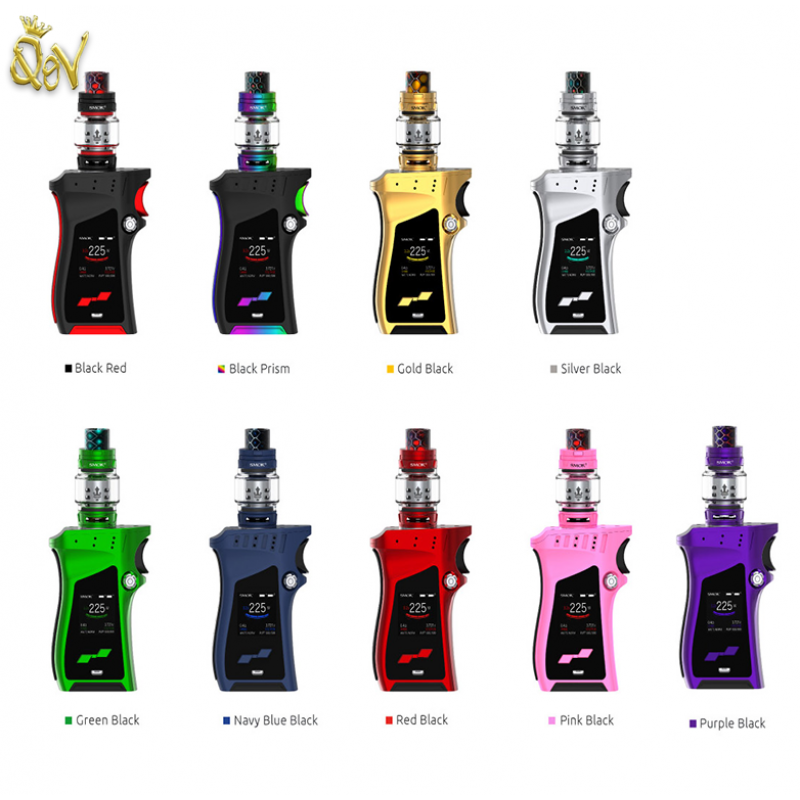 Also included in this kit is the Smok TFV12 Prince tank that is matched in color with the box mod. This tank can hold a massive 8ml of e-juice, is built with a food-grade/bulb shaped glass tank tube, has an easy top fill system with lock button, comes with a snake pattern Cobra drip tip and utilizes the latest Prince coil system with a wide number of options. For more information or to purchase this amazing atomizer, visit our previous Smok TFV12 Prince Tank deal page. Temperature range:200? to 570? or 100? to 315?